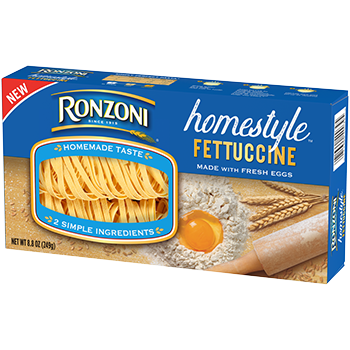 Ronzoni® Homestyle™ Fettuccine gives you a fresh, homemade taste that comes from two simple ingredients: high-quality semolina wheat flour and fresh eggs. Gently rolled and dried for a light texture and flavor, Ronzoni Homestyle pasta elevates your everyday pasta experience into something you will love. 2. ADD PASTA to boiling water. Cook uncovered, stirring occasionally. Cook for 5 to 7 minutes.